A pretty thorough account of the salient points of the Vybz Kartel trial along with background information. Often in the course of his prolonged trial I found myself wondering if the rollercoaster life of Adidja Palmer aka Vybz Kartel was scripted by someone channeling Breaking Bad, the wildly popular American TV series about the rise and fall of a chemistry teacher turned meth dealer. By the time the trial ended I knew it was nothing of the sort, just another wickedly original Jamaican libretto. Described by some as the country’s pre-eminent lyricist, for more than a decade Kartel ruled the roost in Jamaica as its reigning dancehall deejay (”a genre that is to the roots reggae of Bob Marley as hip-hop is to R&B”), his street cred extending far beyond Kingston, into the nooks and crannies of ghettoes all over the Caribbean, into urban America and as far away as Africa where his Gaza Empire has spawned copycats. By late 2013 Vybz Kartel, 38, was being portrayed by the police and the justice system as Public Enemy No. 1. His fame and fortune notwithstanding, on April 3, 2014, Adidja Palmer was sentenced to life in prison with no parole possible before 35 years, after the court gave itself an extra week to determine whether the embattled DJ should be allowed to make music while incarcerated. He had been found guilty almost 3 weeks earlier, along with three others, of the murder of one Clive ‘Lizard’ Williams, a dancer and foot soldier in the small army of roughly 30 men that constituted Vybz Kartel’s entourage. These men ensured that Kartel’’s interests were looked after and his bidding done at all times. It was a dramatic trial with twists and turns that kept the nation in suspense till the very end. As the Prosecution laid it out, Lizard ran afoul of the popular deejay because he and Chow, another member of the entourage, were given two of Kartel’s (illegal) guns, then failed to produce them when asked for their return. After several futile attempts to get the guns back, Lizard and Chow were summoned to Kartel’s house where there was a confrontation between them and Kartel’s cronies. Chow managed to get away, later becoming the Prosecution’s star witness, but Lizard was bludgeoned to death. Although the hapless dancer’s body has yet to be found Vybz Kartel and six members of his entourage were taken into police custody in September 2011. Kartel’s defence team made repeated attempts to secure bail for him but were systematically rebuffed on the grounds that the Police had good reason to believe he would try and leave the country if granted bail. Rumours were rife that the reason for this unprecedented incarceration was that the police had incontrovertible evidence, including video footage taken from the deejay’s phone, that incriminated Adidja Palmer and his co-accused. The swirling rumours proved to be true. The trial was prosecuted largely on circumstantial evidence— involving sensational Blackberry messages, video footage and voice notes downloaded from the deejay’s cellphone in which Kartel’s voice could be heard making threats about what he would do if the guns, coded as ‘shoes’ weren’t returned. ‘If dem want dem fren fi live dem fi return mi shoes’ he is heard to say on Voice Note 2. In other messages he asks for information on countries he might travel to, the Bahamas for instance, lending credence to the Police’s concern that he might skip bail if granted it. The Defence team did not dispute that the voice heard in the notes was Kartel’s. Instead their strategy was to prove that the cellphones in question had not been properly secured by the police, who were careless about maintaining the chain of custody, making it possible for the notes to have been tampered with or manipulated. They also proved that other key items of evidence such as a backup disc provided by the phone company and a notebook belonging to a policeman witness had gone missing. They were able to show also that Kartel’s phone had been used three hours after being taken into police custody. The long and tension-filled trial lasted nearly four months, ending suddenly on March 13, on the sixth day of the Judge’s summation, after a juror was accused of attempting to bribe the foreman of the jury and fellow jurors. Despite this dramatic development, which might have derailed the case had the Judge called for a mistrial, the trial was hastily concluded with the jury delivering a ten to one guilty verdict. The kind of security put in place by the Jamaican Police on the day of the verdict and again on the day of the sentencing, suggested that this was the trial of someone far more important than a mere music personality. The Police blocked major roads leading to the Supreme Court in downtown Kingston, placed Police personnel in riot gear at strategic points and patrolled the area around the court with mounted Police. The diminutive Judge, known informally as Little Lenny, appeared in court flanked by four bodyguards. During the final days of the trial American rapper Busta Rhymes attended court in a show of support for Vybz Kartel. Notably absent was anyone from the local music fraternity among whose ranks there did not appear to be much sympathy for the beleaguered DJ or sorrow over his fate. Although a large crowd had appeared outside the courtroom shouting ‘No Teacha, No school’ on the day of the verdict (a reference to Kartel ‘s nickname–‘The Teacher’) and the days leading up to it, on sentencing day there was only a modest crowd in attendance outside. The elaborate preparations made by the Police seemed like overkill. 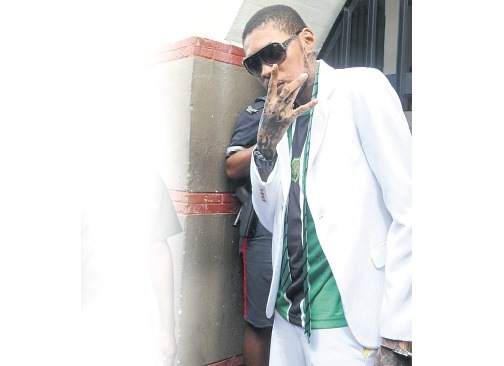 Vybz Kartel: DJ or Don? or both? The smartness, the nimbleness of mind; Kartel could string words together. In terms of that hip hop flow, spitting lyrics, he was the quickest and the nimblest and easily the most brilliant. He was the lyrical genius of his generation who flooded the Jamaican market with music. He delivered the social commentary but he also gave the public fun and games with his song about Clarks shoes (which caused a spike in sales for the company) and Ramping Shop which was banned from Jamaican airwaves for its raunchy lyrics. He outraged every sensibility in Jamaica and then he started to bleach. He always had an avalanche of new material. But there was also a sinister element, a darker element. He overreached by flying in the face of the establishment in Jamaica, by continually goading them. He always flew in the face of authority. Opinions about Vybz Kartel vary depending on the demographic of the person you’re speaking to. Nicknamed World Boss and Addi the Teacher or ‘Teacha’ by his adoring fans his phenomenal popularity made him the envy of politicians though he didn’t kowtow to their demands. On the other hand Kartel was known to hobnob with top dons or gang leaders like Tesha Miller of the Klansman gang and Christopher ‘Dudus’ Coke whose sensational arrest and extradition to the United States occupied international news for weeks in 2010. “A lot of DJs see themselves as dons; the don is the model, so they behave like dons. Dons have the power, they have the girls and DJs are in the best position to become dons because they have the constituencies, “ says Anthony Miller. According to ethnomusicologist Dennis Howard the nexus between political dons and musicians in Jamaica goes back to the very roots of Reggae and Dancehall. It was a symbiotic relationship, the musician needed the support of the don who often demanded a ‘big up’ while the don fed off the popularity of the singer. The globally celebrated singer Bob Marley himself was friends with a number of dons/gang leaders across the political divide so Kartel’s association with gang leaders and the underworld was by no means unprecedented. The problem was that with Kartel there no longer appeared to be a distinction between the two. In 2009 when Vybz Kartel fans (Gaza) clashed violently with rival deejay Mavado’s fans (Gully), the two were summoned to a meeting with then Prime Minister Bruce Golding but the only person who could rein them in was Prezi–short for President– Tivoli Gardens enforcer Dudus who forced the two deejays to publicly end their hostilities at his annual stage show ‘West Kingston Jamboree’. While Mavado seemed to heed the pleas of the government and the Police to reform himself Kartel continued along the path he had chosen, thumbing his nose at the police and Jamaican society while continuing to parlay his carefully cultivated notoriety into profits. He now diversified into other products such as a line of clothing, bleaching soap and his own rum. Perhaps the last straw for the police was the much hyped launch of Kartel’s own show, Teacha’s Pet, “a reality TV dating show surrounding the love life and career of the Artiste Vybz Kartel.” Within a few weeks of the airing of the show Kartel was arrested and the show discontinued. Why were the Jamaican police so single-minded in their determination to put Vybz Kartel behind bars? Why was he considered such a menace to society? Again stories abound. The Minister of Justice, Peter Bunting, had been touring Montego Bay, center of the vicious Lotto Scam conglomerate, which preys on elderly American citizens, scamming them out of thousands of dollars of their savings each year. In fact the Minister was under pressure from the Americans to smash the criminal enterprise. As he visited area after area he was told by residents in each community that he should go easy on the scammers because what they were doing was, after all, merely a form of reparation–collecting monies due the citizens of Jamaica for the years of free labour provided during the era of plantation slavery. The catchy tune was even quoted by American TV host Dan Rather in a 60 Minutes expose of Jamaica’s Lotto Scam, adding to the pressure on the Jamaican government to rein in the criminal elements who were preying on America’s elderly. Although Kartel’s lyrics were never explicitly used against him in the trial, they would have been on virtually constant rotation in the minds of the Judge, Jury and Prosecution. In addition to the song about Reparations there were any number of gangster lyrics issuing from the prolific hit machine known as Vybz Kartel. Perhaps the thing that most cemented Kartel’s image as a demonic creature who had to be contained for the safety of the public was his unconventional appearance, aided by the increasingly visible tattoos embellishing his bleached skin. This more than anything literally marked Kartel as a devil-worshipper in the eyes of fundamentalist Christian Jamaica. As if he realized this, Kartel addressed the issue as soon as he was given a chance to speak for himself in court. My Lord, I bleach my skin, I am heavily tattooed also but that is merely superficial. That is a part of the persona of Vybz Kartel not Adidja Palmer. I am a normal person like anyone else. Inspired by Jay-Z’s 2010 autobiographical narrative, Decoded, Kartel’s book, co-written with Michael Dawson, is a combination of lyrics, their interpretations, anecdotes, philosophical reflections, and autobiographical information. Written very much in the mode of a teacher analyzing and explaining the world, it was also a resounding call–Gaza mi seh!–for ghetto people everywhere to get together and stand up for their rights. “Its not a moral war, it’s a financial war, dem nuh waan ghetto yute fi have house n car,” goes the catchy line from one of his songs. “Incarcerated but not silenced” and “I pray this book helps to change Jamaica forever,” say blurbs on the cover with an image portraying Kartel as a Malcolm X type figure. Some think the book was published because Palmer knew he had to lay the groundwork to shift public perception of himself as a common criminal. That may be so but in the process he managed to harness a cynicism about the system—coded as Babylon in Jamaican parlance—that has great currency. Though his music is viewed as having no explicit political message his concept of ‘Gaza’ has the resonance that rival DJ Mavado’s ‘Gully’ never had though both are metaphors for the underclass that spawned both musicians. Gaza is the name Kartel gave the locality he comes from in Waterford, part of the bedroom community of Portmore, on the outskirts of Kingston. Inspired by the fierceness of the inhabitants of the original Gaza Strip in Palestine, Kartel adopted the name of this embattled settlement in the Middle East, and the shibboleth of his supporters around the world became Gaza mi seh! Usain Bolt has been one of Kartel’s most avid fans not allowing other deejay’s music to be played at his parties and giving the Gaza sign whenever he was in the limelight. Many of Jamaica’s top athletes are Gaza fans though they may be slowly backing away now. Perhaps the best way to understand Gaza is to see it as a new identity–underpinned by a Ghetto pride ideology–a defiant “Yes, we’re from the ghetto and we’re proud of it” stance. Although Kartel intended Gaza as a response to the lopsided landscape of opportunity in Jamaica that renders the poor socially invisible, the concept rapidly grew legs and migrated all over the world, an indication both of his talent and the globalization of inequality that disproportionately affects ghetto-dwellers worldwide. While the Jamaican judiciary jubilantly celebrated Vybz Kartel’s guilty verdict and sentencing as a resounding victory for itself it is worth noting that alleged crime boss and head of the Shower Posse Christopher ‘Dudus’ Coke, now serving a 23 year sentence in the US, was never charged or prosecuted for breaching the law in Jamaica where he lived. Similarly David Smith, who defrauded investors across Florida and the Caribbean out of more than US$220 million was sentenced to 30 years in federal prison in the US. Although he operated out of Jamaica, Smith like Coke, was never charged or prosecuted for any crime or misdemeanor in Jamaica. And then less than a week after the guilty verdict was announced in the Kartel case, Kern Spencer, a young politician belonging to the ruling party, was found not guilty of significant fraud and money-laundering charges in relation to the distribution of energy-saving light bulbs, a gift from the Cuban Government. The Director of Public Prosecutions herself expressed shock at the verdict saying that the evidence against him had been overwhelming. But for most people the Kern Spencer verdict was par for the course. You can count on the fingers of one hand the number of politicians, police and big businessmen who have ever been convicted of any crime in Jamaica. Jamaican Police and the country’s legal system now have to prove to cynical Jamaicans that they not only have the will and drive to successfully bring rogue DJs to book but also the numerous rogue policemen, politicians and businessmen still at large. If not, as Kartel’s song ’Sup’m a go happen’ warns Jamaica could be on the brink, like Egypt, like Tunisia before it, of ‘something happening’. POSTSCRIPT: Since the sentencing of Adidja ‘Vybz Kartel’ Palmer and his co-accused on April 3 there have been some interesting developments. The very same day the Police High Command issued a statement detailing among other things the security challenges they had faced in the course of the trial and the numerous “attempts to pervert the course of justice” they had been confronted with. It now is much clearer why they were so determined to put Adidja Palmer behind bars. Another interesting piece of information came from Shawn Storm’s attorney Miguel Lorne, who revealed that his client had been offered a plea bargain that would have resulted in a much reduced sentence for him. His client turned down the offer, sticking by Vybz Kartel and in the process, also receiving a life sentence. And yes it’s true. Kartel’s lawyer, Christian Tavares-Finson IS the half-brother of Junior Gong or Damian, Bob Marley’s youngest son. Lead attorney Thomas Tavares-Finson who headed the defence team was once married to Cindy Breakspeare, whose son with Bob Marley he helped raise. Tom and Cindy have two children of their own, Christian and Leah. Incidentally Tavares-Finson Sr. is a highly sought after criminal lawyer with a star-studded list of former clients such as Grace Jones, Gregory Isaacs, Big Youth, Bounty Killer, Mavado, Sean Paul and Shabba Ranks, who retained him to defend them against charges ranging from cocaine possession to ‘using profanity’, a uniquely Jamaican offence. In more recent times Tavares-Finson, also an Opposition Senator, was most wanted Christopher ‘Dudus’ Coke’s lawyer until forced to step aside due to his political obligations. The sentence was life, without parole before 35 (not 25) years. ‘suggested that this was the trial of someone far more important than a mere music personality’? Of course, no ‘mere music personality’: ‘his Gaza Empire’ makes that clear, as does his ability to parley musical success into business (as you note, with rum etc. and TV reality show). Nothing mere about all that. Thanks, you’re right, let me make that correction…to outsiders who don’t know he’s a mere musician. what’s the fuss all about? that’s what i’m setting up, that’s all, can’t assume all my readers know everything about Jamaica 🙂 thanks for your comment and the correction! Just realized what happened, wrote this piece the day before the sentencing so i was guessing at 25 years and forgot to make the changes before posting it this morning. really grateful to you for letting me know. Blurring the thin the lines of reality, fantasy and myth is easy for some! Thankfully the Judge and Jury suffered no such illusion and the reality of sound judgement won the day. Vybz Kartel has received a life sentence. This is big news in JA. Read a great account here. Your answers include reparations song, his bleaching/demonic images, etc. 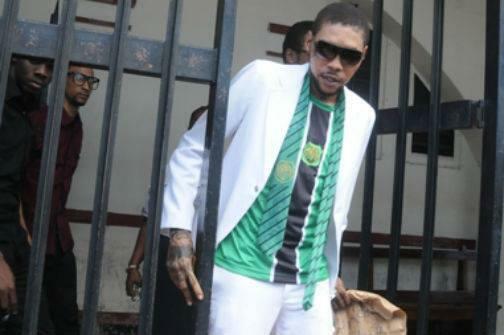 Many people been asking the question about whether it is the Vybz Kartel persona that was on trial. I suggest that the answers are much simpler. Ask the people from Waterford who are not Gaza fanatics about Kartel. Ask about the armed thugs. Ask about gun dealing (remember at the heart of this all is that two of his guns went missing). Ask about the other people he has ‘allegedly’ killed (remember he had another murder charge that was dropped and there are stories of many more). The influence he had over people is a part of the reason they wanted him, but under all of that, the man was a murderer, gang leader and arms dealer, and had become uncontrollable so time to get rid of him. Thanks absentminded, you’re probably right, and i’ve added a link to the statement put out by the police the day of the sentencing which details attempts to pervert the course of justice etc…and of course what I’m suggesting is that the line between don and dj became blurred in the case of Kartel which certainly is an acknowledgment of the points you’re making. Another chapter in dancehall history. Hail Annie Paul, hopefully reality has set in for the delusional gaza fanatics. I lived in Waterford…Litchfield road to be precise (google map that if yuh waan know weh)…closer to ‘third world’ (my family still has that house which is now rented to some really nice tenants). I have seen the deterioration of my former community over time due in part to Kartel and his mindless fanatics, some idiots that live down by third world and State neglect. Waterford is turning into a ghetto, the community is dying…more like being killed by a ghetto mentality perpetuated by some elements of the community. I therefore have no sympathy for anything Gaza (just the real Palestinian issue). That said, for those who support lawlessness, gunplay, ‘badmanism’ and praise behaviour not fit for civilized society…for all rebels with a self indulgent cause…then the sentence should be DEATH not life…with the possibility of parole after 35 years. Finally, here is a suggestion, maybe you can blog about the miscarriage/aborting of justice in the Kern Spencer case. The abortion, it is suggested occurred because two women couldn’t get along —The Judge and the DPP. My wife and female friends have suggested that women seem to hold a grudge for eternity, especially against female colleagues…not so sure about that view. My feeling however is that Kern is just as guilty as Kartel but a tad bit luckier. Damn lady luck, she comes in the form of a pissed off judge. Thanks much Anonymous, its great to hear from someone who knows Waterford, ‘third world’ etc and can furnish us with some real life experience from the area. Unfortunately I tend to write about things I have a deep interest in and some knowledge, the Kern Spencer case induces severe boredom in me, Snore. though of course the way you put it makes it sound like something out of Scandal and therefore more than exciting–most ppl agree with you that Kern was guilty but because he’s an ‘insider’ he gets off…part of the shenanigans that pass for governance in this ya postcolony…. LOL this is you isn’t it Stero? eehe eehe! Hail Annie Paul, you know I am always anonymous. lol. By the way…don’t tief da laugh deh yuh nuh. eehe. In all the coverage, including your otherwise fair and informative account, there’s been scant mention of Vybz Kartel’s shameless and heartless homophobia, regrettably a touchstone of his popularity. I mourn the fact that it’s people such as he, promoting the most negative stereotypes of Jamaica, who garner the spotlight and undue respect. really? have to listen to that one…or find the lyrics…why do you think so?